But when her latest investigation turns up not only foul play, but sacrificial rights, she’ll find herself racing to stop a murderer intent on sacrificing her friends. J.L. Hendricks is a USA Today Bestselling Author who enjoys many genres, as evidenced by her catalog of available books. She is currently focused on Scifi and Urban Fantasy, but has also written Paranormal and Christmas books. 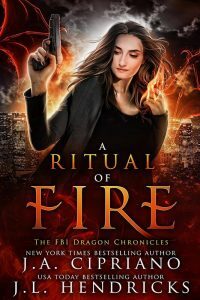 Her latest series is an Urban Fantasy with her Voodoo Dolls Series, and then back to her Worlds Away series!